You can prepare these a day or two before and keep them ready to fire off in batches when your guests arrive. Pregnant people are usually advised to take extra precautions when consuming various seafood. Be sure that the person preparing practises proper storage and discards any clams that do not open with ease or have cracks in the shells. As the shells are very heavy, you may also choose to save a few of them in case you feel the need to surprise someone with a ridiculous costume or an ultraistic next level piece of art for people to fix their eyes on in astonishment. You won’t have to say much to get your company to gravitate toward the familiar flavours of Cup Match. 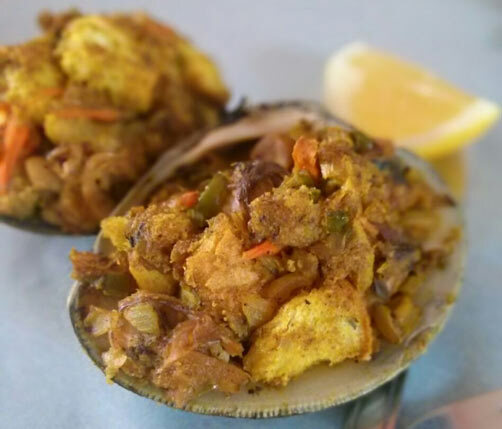 After winning over the guests with your abundance of creativity, this substitution for the classic mussel pie may go down in history — introducing the cutesy curried clam ‘stuffies’. Of course, you’ll have those stubborn few who may not yield their yearn for the usual fixings of pastry pie, but I’m sure you can coach them into parading around your Cup Match celebrations mashing back one of these babies. For starters or snacks, save time and cholesterol points by avoiding that shortcrust pastry. People generally appreciate caring gestures that keep their heart healthy and stomach full of personally handcrafted deliciousness. 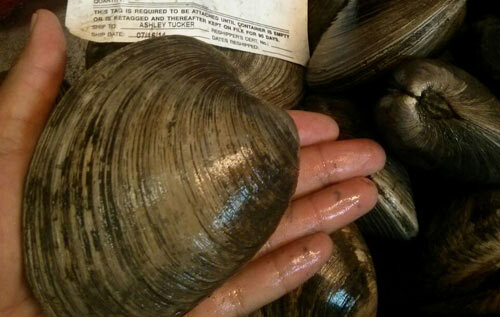 Compared to its not so distant cousin, the mussel, clams have superior nutritional benefits. For all those who are looking to increase iron into their diets, this recipe can benefit those who suffer from anaemia as clams provide an impressive burst of iron per serving. A 100g serving of this lean protein sources 155 per cent (28mg) of the daily recommended (DR) intake of iron —100g is about the weight of a deck of cards. If you don’t eat a lot of animal protein, your new saving grace — clams — will surely boost your intake of the essential vitamin B-12, as each serving boasts over 1,500 per cent of the DR intake of this organic substance that promotes red blood cell production and supports metabolic function, DNA replication and neurological functions. One of these succulent seafood servings will pump up the body with 1/5th of the calories compared to the traditional mussel pies. Hearty alternatives hopefully promote guilt-free holiday pleasantries for you and the family to enjoy over heartfelt conversations and magical memories. Wash the shells well and place into boiling water for 6-11 minutes. Wait for the shells to pop open. Preheat oven 375°F. 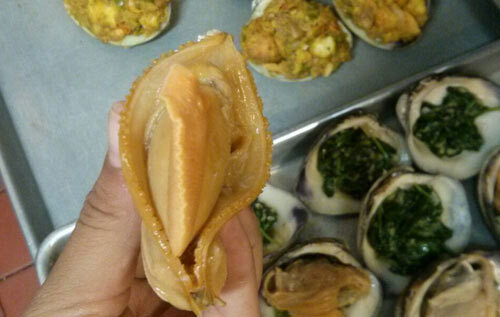 • Open quahogs, scrape meat from shells. Save juice in separate bowl. Place 20 pieces of the shells on a sheet pan after you have removed and discarded the tough membrane that holds the meat in place and shells together. • In a large bowl, place the bread. • Add the chopped clams into the large bowl. 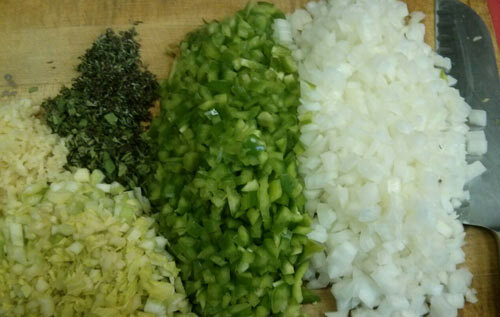 • In a medium-high heat frying pan, add oil and sauté onion, green pepper and celery — cajun mirepoix — until soft, but not brown. Add the garlic and curry powder. Cook for additional minute and deglaze with the sherry. • Add sautéed mierpoix, herbs, julienned carrot and seasonings to bread mixture; mix well with 1-2 cups of the clam juice so that it sticks together but is not too soggy. • Wash shells to get any chips off and separate onto sheet pan. • Place heaping handfuls of the stuffing into the shell halves. • Sprinkle top with paprika. • Set sheet in oven and bake for about 30 minutes or until heated through. • Serve with lemon or smear with other traditional and culturally accepted condiment sauces.